Its cost-efficient price, wide array of colors and durability made asphalt shingles popular among our customers. Asphalt has a service life of approximately 15 years, which is ample time to safeguard your family from outdoor elements. There are two types of asphalt shingles on the market: the 3-tab and the architectural shingles. For customers who live in windy areas or experience frequent wind-driven rain, 3-tab shingles firmly resist wind uplift. While customers who wish to put more effort into their roof exterior should go for architectural shingles; there are plenty of designer options are available for your roofing system with the same level of weather protection. Homeowners looking for excellent protection with traditional appeal find wood shakes or shingles the perfect fit for their needs. Wood’s natural beauty gives any home exterior a rustic look you can’t get from other roofing materials. Wood shakes also last longer than asphalt by up to 10 years with proper maintenance. The biggest advantage of installing a wood roof is how both cedar and redwood contain natural oils, which make them resistant to moisture. It’s a huge help in combating water damage, especially if you live in a storm prone area. The metal roof has risen to fame because of its impressive energy efficiency and sustainability. You can greatly reduce the roof waste you’ll generate for your next installation project with this material over your head. You’ll also have fewer energy costs due to how it naturally reflects heat from the sun to keep your interior cozy. Another upside of having a metal roof is how quickly it sheds both snow and rain, which means your home is well-protected from water damage through any season or weather condition. Your roof replacement project is in good hands with us. 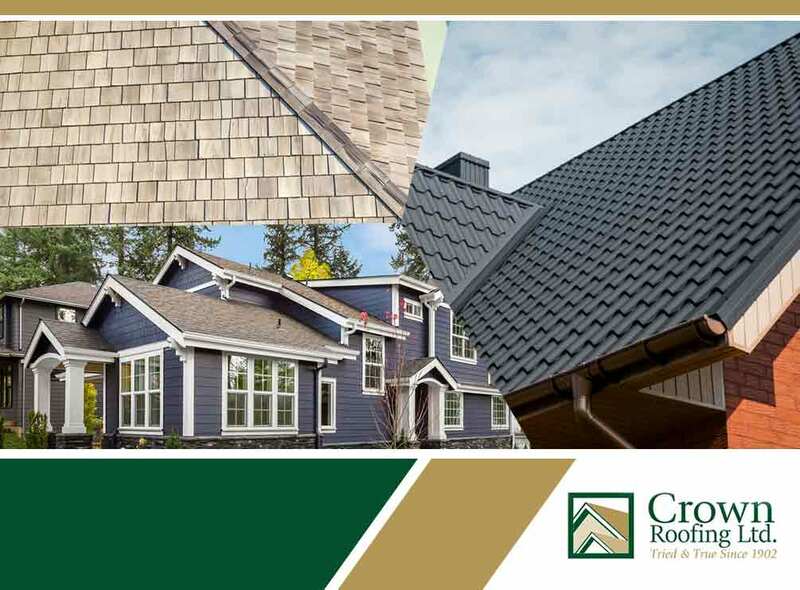 Crown Residential Roofing serves homeowners with quality roofing products. We also deal with storm, wind and other damage on your roof with our excellent emergency repair services. Call us today for more details at (604) 210-6655, or fill out our contact form to request a free project estimate. We proudly serve homeowners in Surrey, New Westminster and other nearby areas.